Take your library on the go. It is easy and convenient. Use your mobile device to find library directions and events, find and request books or connect to us on Facebook and Twitter. Download our app, which works on all major platforms. iPhone, iPod Touch, and Android users can download directly in the Apple App Store, Android Market or Blackberry App World. 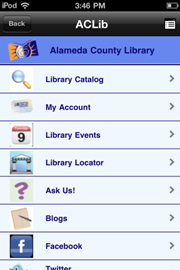 Search for ACLibrary Mobile. You may also go to http://acl.boopsie.com using your mobile device’s internet browser. For more library-related apps, please see our Mobile Guide.